I’m pretty sure that when André Breton and his Surrealist colleagues collaborated on The Exquisite Corpse in 1938 — that bizarre photo-collage of a giant with a larva on his head, a train spewing smoke in his beard, and a vise for a torso — they never would have predicted their creature would star in a boss battle in a 21st century work of weird fiction by the genre’s most prominent Marxist. The Surrealists saw themselves as revolutionaries, but the revolutionary thing China Miéville does is conscript the Surrealist aesthetic as well as its politics into the service of a story that is pure pulp-fiction wartime suspense thriller, a work of unabashed bourgeois entertainment, set in a world gone surreally mad. It’s possible the actual Surrealists would hate it for that. Except maybe Dali, who seems like he was pretty chill about that kind of thing. 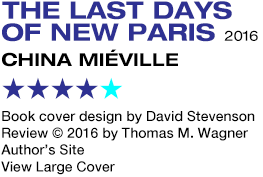 The Last Days of New Paris is just the tonic for readers aching for some of the old China Miéville New Weird magic, who may have felt This Census-Taker wasn’t nearly weird enough. In this story, barely more than a novella itself, Miéville literalizes the concept of art as revolutionary act by having Nazi-occupied Paris embroiled in endless street fighting between the hallucinatory manifestations of Surrealist automatic drawing and the hellish monstrosities called to life by Nazi occultism. With the spectacle of centaur tanks and tentacle plants snatching Messerschmitts out of the sky, we have absolutely achieved Peak Miéville with this one. It’s 1950, nine years after Paris was transformed by an explosion called the S-Blast, detonated through a series of unfortunate events I will leave you to discover yourself. Now the dreamscapes of the Surrealists have taken on tangible, real world form. The city of light is now the city of exquisite corpses and burning giraffes and telephones. Manifestations (“manifs”) of Surrealist paintings walk, crawl, float, or otherwise move through the houses and streets, and the city has been completely sealed off to prevent any spread into the outside world. But the manifs are uncontrollable, doing battle not only with Wehrmacht and SS battalions but any unfortunate person in their path. Still, the Nazis are attempting control, summoning up not only their own manifs but, with the aid of a renegade priest, demonic entities from the abyss. Thibaut is a young guerrilla Surrealist resistance fighter trying to survive on the streets, and wracked with guilt for having failed to support other members of his cell, slaughtered in an ambush. At first, his story seems to be moving randomly, without direction, but it works here because we understand he’s living where anything resembling rules of reason and logic have been wiped away. Thibaut eventually encounters an American woman, Sam, who claims at first to be a photographer assembling a book. It’s an implausible, transparent cover story, to say the least (though there have been attempts by curiosity seekers and artifact hunters to enter the city). Soon Thibault teams up with Sam in a race against time to discover a Nazi plot that could turn the tide of events in a direction even more disastrous than they’re already in. I ended up reading this twice, because on the first pass my rhythm was interrupted on each page by stopping to Google every single Surrealist work of art that was making a cameo in the story. Miéville drops so many names of painters, poets, politicians and other agitators that the whole thing feels like fan service for fine arts majors. If you’re a longtime reader of Miéville, this all feels entirely in character for him, and doesn’t take you out of the story. For my part, using the book’s endnotes — yes, it has endnotes — to look up its endless stream of references made me want to learn more about the Surrealists generally, and eventually took me to some YouTube documentaries. I took a greater interest in the art and the people who created it. In turn I felt like I’d been debriefed and more prepared for what the story was about to put me through. But Miéville’s stroke of genius is in incorporating this level of academic art school nerdity into a briskly-paced wartime potboiler full of shootouts, chases, spies, secret messages, treachery, and the odd bit of demon-summoning. There are wildly entertaining twists and turns galore, and the shortness (only 164 pages for the main story, plus the endnotes and a fourth-wall-breaking epilogue) works entirely to the story’s benefit. There’s a Perdido-sized epic that could easily be written here, but China Miéville took the wisest course, allowing the tale’s images and sensations just enough time to settle in your mind like the haunting, indelible memory of a dream.